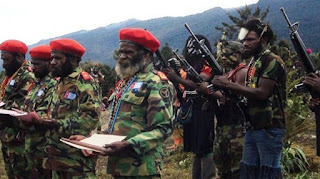 The West Papua National Liberation Army has claimed responsibility for the fatal shooting of an Indonesian soldier in Papua province yesterday. The shooting took place at a market in Sinak in Papua's Puncak Jaya regency. A Highlands-based Defense Region Command of the rebel group, which says it is waging a war for West Papuan independence from Indonesia, made a statement about the attack. A spokesperson confirmed a team of his men shot the soldier dead. He said the shooting was a message to the government of Indonesia and the global public that the West Papua National Liberation Army would not cease to oppose the military and the Indonesian police. Advocacy groups have urged Jakarta to end human rights violations and improve media access to the area, where militants linked to the Free Papua Movement have been targeting operations at the vast Grasberg copper mine run by American company Freeport McMoRan. Rights activists have accused Indonesia's security forces of abducting and torturing indigenous Papuans and using deadly force to quell their protests.